Abies balsamea 'Jamie' is a diminutive, cushion of a Balsam fir with short needles that curve downward against the branchlets enhancing the appearance of abundant light-brown buds. In spring, the foliage emerges as a fresh, light-green in color, later darkening to medium green as the season progresses. Growth is fairly uniform in all directions at a rate of less than 1 inch (2 cm) per year. After 10 years, a mature plant might be barely 12 inches (30 cm) tall and wide. This cultivar originated as a witch's broom found at the Iseli nursery, Boring, Oregon who introduced it to the nursery trade in 1989. They gave Thom de Lange of The Netherlands the honor of naming the plant. 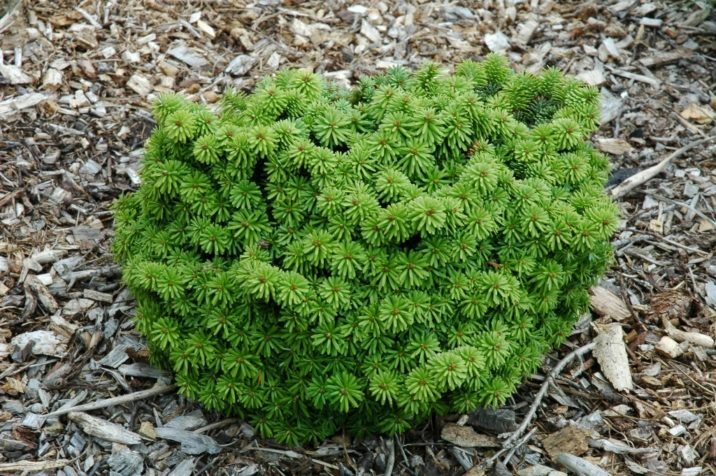 He named it, as well as Picea abies 'Jessy' and Pinus mugo 'Michelle,' after his three grandchildren. This plant is almost always seen in the nursery trade listed as 'Jamy.' However is has been confirmed with Mr. de Lange that his grandchild's name is actually spelled "Jamie" and this is how he'd prefer to see it listed. It is occasionally seen listed as Abies balsamea [WB3] which was the provisional name Iseli nursery gave the plant before handing it over to Thom de Lange. Abies balsamea 'Jamie' — a perfect specimen.